For our South Australian supporters, please contact your Members of the Legislative Council in South Australia urgently. Tammy Franks MLC (Greens) has introduced the Statutes Amendment (Abortion Law Reform) Bill 2018 to be debated on Wednesday 27 February 2019. Abortion is already available up to 7 months in South Australia. 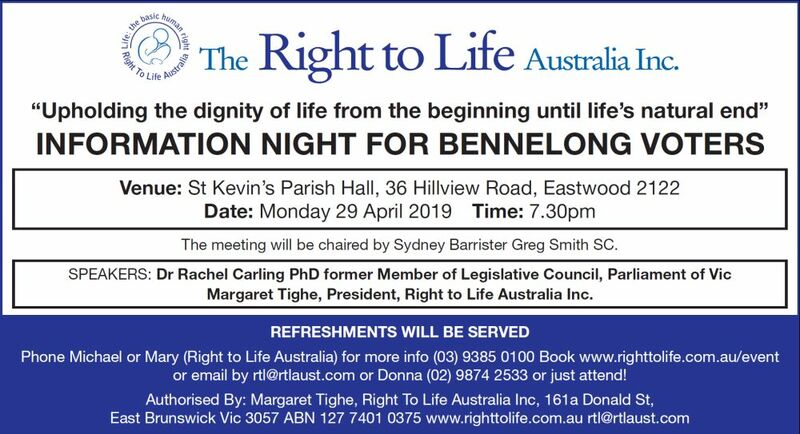 As Victorians approach the polls on 24 November 2018, Right to Life Australia calls for a vote against the Andrews Labor government purely and simply on the basis of their appalling track record on the destruction of human life. Stop Senator Leyonjhelm's Bill today!